Rafael Benitez's Chelsea nightmare continued on Saturday as West Ham hit back to inflict his first defeat in charge and extend his winless start as interim manager. Already the first boss of the Roman Abramovich era not to oversee a victory in his opening two games under the Russian, it got worse for Benitez at Upton Park on Saturday afternoon as the Blues made it seven Barclays Premier League games without maximum points. Juan Mata appeared to ease the pressure on the former Liverpool boss by ending the European champions' five-hour, 34-minute goal drought after 13 minutes on Saturday. But the visitors squandered several chances to score again and were deservedly made to pay through a controversial Carlton Cole equaliser and goals from substitutes Mohamed Diame and Modibo Maiga. West Ham fans taunted Benitez with, "You're getting sacked in the morning", while the torrent of abuse from Chelsea supporters also continued. There were early warning signs for Chelsea on Saturday, with a defence reshaped by David Luiz's suspension failing its first real test in the 10th minute when a straight free-kick from James Collins sailed over everyone to Winston Reid, whose header across goal was scrambled to safety by Cesar Azpilicueta. Fernando Torres was dropping into midfield to get involved with mixed results but it was the return of his striking instincts that helped Chelsea end their longest goal drought of the Abramovich era. Benitez kept his promise not to celebrate the first goal of his reign, which did not spare him chants of "One Di Matteo" and "You're not welcome here" from the visiting fans, along with the ubiquitous 'Rafa Out' banner. Chelsea should have given their supporters something else to cheer about, Moses horribly mis-hitting his 20th-minute finish from Ramires' pass. And after Carlton Cole - in for the injured Andy Carroll - saw a shot blocked, Ramires and Torres blew a four-on-two break, the latter skying his finish to spark the inevitable "What a waste of money" chants. West Ham were also causing problems and thought they had equalised in the 33rd minute through Kevin Nolan's close-range overhead kick but referee Martin Atkinson controversially chalked it off for a push. Mata could have made it 2-0 in the 40th minute when he fired Moses' cutback too close to Jussi Jaaskelainen and saw his follow-up blocked by Joey O'Brien. The home side had the final attempt of the first half when Petr Cech was booked for punching the ball clear outside his area the goalkeeper redeeming himself by tipping Nolan's header over the bar from the resultant free-kick. Hammers boss Sam Allardyce had seen enough by the break, sending on Matt Taylor and Diame for James Tomkins and Gary O'Neil after what could only have been a half-time roasting. 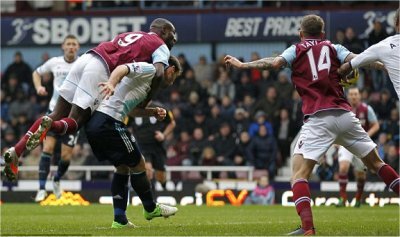 Both had the desired effect, Carlton Cole's header from just inside the box sailing over before he got in the way of Diame's effort. Chelsea's defending became more desperate, Branislav Ivanovic getting a vital touch to prevent Carlton Cole turning in Nolan's pass after Cech went AWOL. An equaliser looked only a matter of time and it arrived in the 63rd minute in controversial fashion. Matt Jarvis' cross looped up off Azpilicueta and Carlton Cole climbed all over Ivanovic to nod it in, Chelsea's protests only resulting in a booking for John Obi Mikel. Mayhem ensued and Jarvis tested Cech before the visitors surged down the other end, Torres scuffing a glorious rebound chance straight at Jaaskelainen after the keeper saved from Eden Hazard. Mark Noble was booked for clattering into Ramires and Mata almost added further punishment when he hit the inside of the post with a brilliant free-kick. Moses appealed in vain for a penalty under Taylor's challenge and Hazard failed to chip Jaaskelainen after the keeper threw the ball straight to him. Oscar immediately replaced the Belgian but West Ham were still on top and Moses soon departed for Marko Marin. Although Chelsea enjoyed some pressure, they were almost undone when Noble sent Jarvis clear and Cech came to the rescue again. Ashley Cole did likewise from the resultant corner, nodding Reid's header off the line but West Ham were not to be denied. With four minutes remaining, a throw-in found its way to Carlton Cole, who laid the ball off to Diame to drill home and it got worse in stoppage time when fellow substitute Maiga followed up after Taylor's shot was parried. Torres had the final say with a header that was saved but it was already too late.